Bracelet length is approximatley 21.5cm long. 10.25mm white fresh water pearl elongated. 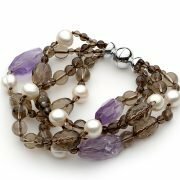 Smokey Quartz, Amethyst and Fresh water pearls are used in the bracelet. All pearls are selected specifically for Bakalian designs.